"INT-252 V2 Dual 15"" 2-Way Passive PA Speaker". "The Intense series from Cerwin-Vega! has established a well-deserved reputation for providing extraordinary and impactful sound at an affordable price. How do you enhance a leading product in its class? Improve the product components, sound quality AND lower the price! Introducing the new Intense! V2. Perfect for PA applications such as live sound, program playback, and DJ systems -- it can be installed in facilities, venues and clubs - yet it is fully portable for sound on the go. So what's New? Stronger drivers - by beefing up the build quality with the addition of more steel.Enhanced durability - by upgrading the cabinet construction with internal bracing.Better performance - is achieved by increasing the size of the magnets on the compression drivers.Improved dependability - from a new positive temperature coefficient (PTC) thermistor that protects the tweeter. This component acts as a self -repairing fuse allowing the speaker to return to normal operation once the input fault is corrected. The Cleanest Sound: The new Intense Series loudspeakers deliver performance you demand at a price you don't expect. 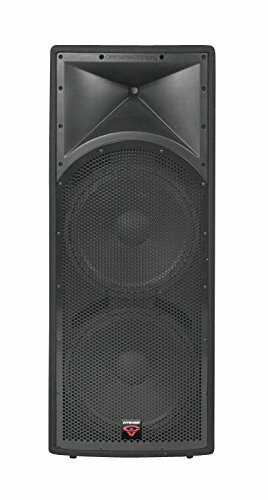 The model INT-252 V2 Dual 15"" 2-way Full Range Speaker paired with the INT-118s V2 cast-frame subwoofer, are tailor-made for gigging musicians, mobile DJs and other portable sound reinforcement applications. The new Intense Series loudspeakers re-define value-driven performance. HighRoad Horns: A big, clean horn when you need it! With its 34mm titanium HF compression driver, Cerwin-Vega! 's HighRoad horn features a larger diaphragm than the competition. You get higher SPL with lower distortion and since the crossover in the INT-252 V2 runs at lower frequencies, you'll hear improved off-axis response and increased mid-range vocal intelligibility. " Stronger drivers by beefing up the build quality with the addition of more steel. Enhanced durability by upgrading the cabinet construction with internal bracing. Better performance is achieved by increasing the size of the magnets on the compression drivers. Improved dependability from a positive temperature coefficient (PTC) thermistor that protects the tweeter. This component acts as a self-repairing fuse allowing the speaker to return to normal operation once the input fault is corrected. If you have any questions about this product by Cerwin-Vega, contact us by completing and submitting the form below. If you are looking for a specif part number, please include it with your message.